Go green & Save! Repair it or exchange it. The more we throw away, the more landfill space we consume and the greater the potential for contaminating our environment. By repairing or exchanging your unit for surplus stock, you benefit the environment by responsible recycling or reusing. All non repairable exchanged units will be dismantled and any recyclable materials will be reclaimed, thus reducing the amount of industrial electronic components added to the waste stream. Throughout the pricing pages of our printed catalog, you will see items in bold type face. These are items that at the time of publication were available for advanced exchange. This list grows every day so check with your salesperson to see if an exchange is available. If we stock the same unit that you need repaired, you and the environment can benefit from participating in the Radwell Advanced Exchange Program. 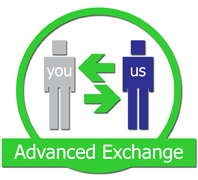 Identify that an advanced exchange unit is available. Place a special Advanced Exchange Order with us for the item at the current price. Only items in RQAUS1 condition are available for Advanced Exchange. Your order and our invoice will show the standard price you would pay for RQAUS1 condition. Send us your unit in need of repair, along with the AEX transmittal form we have provided. After we receive your unit, our QA department will determine if it is repairable and you will be promptly notified. 1) You will receive a credit of 20% on the RQAUS1 item that you already received. This credit may be applied to any future transaction. We can also send you a refund check or process a credit to your credit card. 2) We will repair your unit so it is ready for the next customer that needs an Advanced Exchange. Note: 1) If your unit is unrepairable a credit will NOT be issued and your items will be recycled. 2) Standard rush fees apply if you need your Advanced Exchange guaranteed to ship the same day or within 4 hours of your order. (Advanced Exchange 20% credit does not apply to rush charges or shipping fees paid.) 3) RQAUS1 - Radwell Quality Assurance USED Surplus Level 1.